This exciting new edition of Five Element Constitutional Acupuncture gives a clear, detailed, and accessible presentation of the main features of constitutional Five Element acupuncture. It covers the context and history of this form of acupuncture, as well as the relevant Chinese medicine theory. After examining the Elements themselves and the functions of the Organs, the book explores the basis of diagnosis in Five Element acupuncture, possible blocks to treatment and the treatment itself. It puts this style of treatment into the context of other styles of acupuncture treatment — especially Traditional Chinese Medicine (TCM) as it is used in the West today.FeaturesThe Five Elements referred to in the title are Wood, Fire, Earth, Metal, and Water.Gives a clear, detailed and accessible presentation of the main features of Five Element Constitutional Acupuncture treatment. Covers the context and history of this form of acupuncture, as well as the relevant Chinese medicine theory. Includes an unambiguous description of the principle aspects of diagnosis within a system, ironing out inconsistencies often present in discussions of these aspects.This edition has been thoroughly revised throughout and includes a new and improved colour page design.Quotes from the foreword to the first edition by Peter Eckman, San Francisco:"...the authors have shown how their approach can even integrate with TCM findings to treat patients more completely and rapidly. 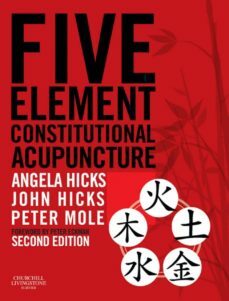 As the case histories illustrate, Five Element Constitutional Acupuncture is a style of practice that is second to none, and this innovative text is an excellent resource for learning it"